This weeks theme is encouraging you to DREAM BIG. At the beginning of the month a lot of people set their goals or intentions for the year. They go hard for the first few weeks then they tend to slow down as they either lose enthusiasm or more importantly they can lose confidence in themselves or those dreams. Going back to last weeks theme .. believe in yourself .. you can do this!! Yes, they might look scary and some days you might want to run the other way, but the scarier they are, the more satisfying they will be when you break through and achieve them. What’s your scary goal/dream? Have you set one yet? If not, it’s not too late, it’s never too late! I’ve just got back from my trip so I still haven’t been able to create a page this week but I have these two lovely pages created by friends. Thank you ladies for some outstanding page examples for this weeks challenge. 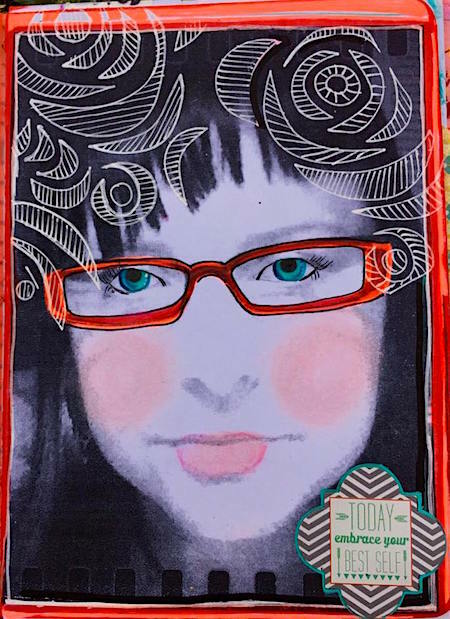 Here’s a link to a video from one of my favourite bold colour artists, Carolyn Dube (you’ll hear some more from her here later in the year) where she uses some very bold colours in her art journals and shows you how to use Dylusions Paints. 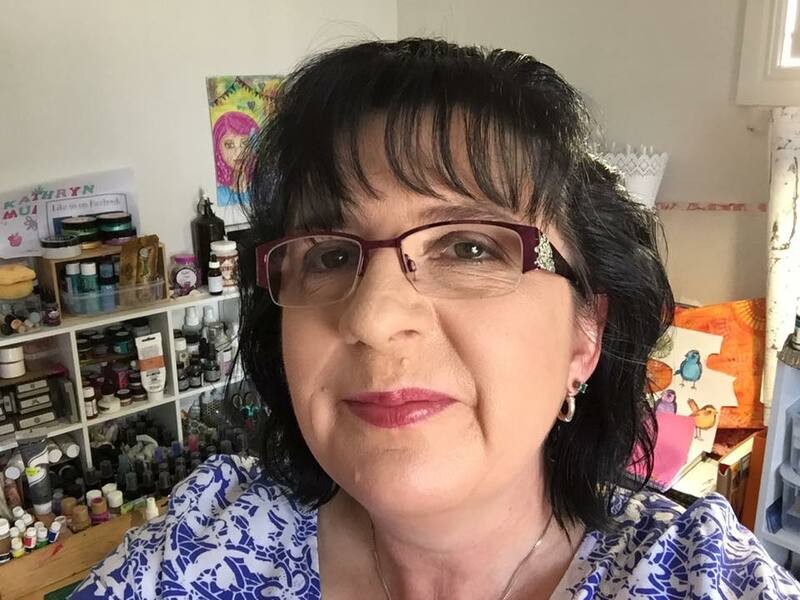 You may remember Tracey as we featured her on our blog here late last year and you may also have seen some of her challenge pages as she is playing alongside us in the Facebook page. We were thrilled to have Tracey join us again as our featured artist this week. Tell us a little bit about yourself .. I am an artist, illustrator and teacher from Wynnum in Brisbane. I have a Masters in art education and have been either creating, or teaching art, or both together for my entire adult life. My work has always been a reflection of where I am in my life, and right now I get to live my creative dreams which is pretty exciting. I create work as an illustrator most mornings, and then I switch gears for watercolours which I sell as originals or prints on my website, or create huge acrylic canvases in the afternoons. In between and over the top of all that is making content for my new YouTube channel, and teaching with a series of online workshops opening from late Feb. Sometimes it freaks me out how awesome my creative life is. This never fails to inspire me to push my boundaries and try things. I tend to lean into new things and am not a feet first person, so I need to be reminded to look for inspiration in new places, to try to see the world with fresh eyes, and to be fearless in letting my personality come through my work and push it out into the world. I am inspired by everything and anything around me. I find I have trouble with too many ideas so I have to edit most of the time. I spent years doing “serious” art and it sapped my soul a bit. I am happiest looking at everyday objects and observing things around me and finding their value. I stopped placing values on whether things were worthy to paint or record and it opened up a whole new world. There is such pleasure in painting the café I went to last week with a good friend, or my new hand wash. If they catch my eye then they are fair game, and I love that it makes me mindful of the loveliness that surrounds me every day. My website, http://www.traceyfletcherking.com/, has some videos from my youtube channel, and also a place for you to sign up for a newsletter if you want to be kept up to date for upcoming classes. I will be re running my Delicious Paint class in a new classroom in late Feb, with more classes to follow. Tracey has very generously donated an A3 print of the winner’s choice from her print shop. This is valued at $55 and will include postage anywhere in the world. New prints are being added all the time so hopefully there will be something there for the winner to love. We will draw a random name on Friday 12th February from those who have uploaded into the Week 5 folder by that date. So you have two weeks to complete the challenge. Now it’s time to draw a name from the photos loaded up into the Week 3 photo album. Today’s lucky winner is … Tina Frost Clayton. Congratulations Tina. This is the page that Tina created about celebrating life. This week’s theme is encouraging you to BELIEVE IN YOURSELF. If we can do that then amazing things can happen. Go forward with confidence and believe in your abilities. You are amazing and have so much to offer the world. Be persistent and keep moving forward. You might stumble occasionally but don’t give up, pick yourself up and keep on going. You can do it! I’m away travelling this week so haven’t been able to create a page myself but I have these two lovely pages created by friends. Here’s a link to a video from YouTube artist BeCre8ive2 where she does some very creative lettering with some words that fit perfectly with this weeks challenge. Susan Farrell is an Intuitive Artist/Teacher specializing in Healing/Visionary Art from Rye, Victoria, Australia. She is the creator of the “Serendipity Intuitive” Workshops, which she teaches all over Australia. 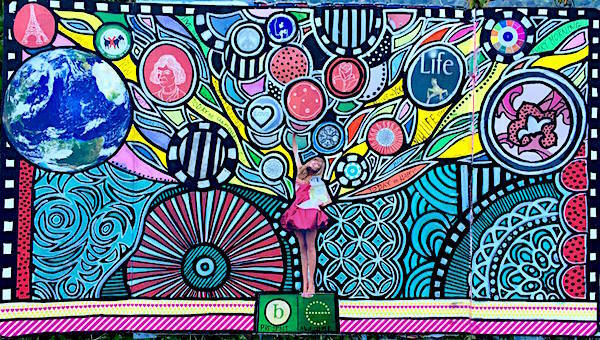 Her mission in life is to inspire as many souls as she can, to start painting & creating! It is her belief that everyone is an Artist! “I still believe in Magic” is my motto. Life can send us lots of ups and downs and we can get a bit jaded through the journey. Since I was a little girl I have always been able to see magic everywhere. 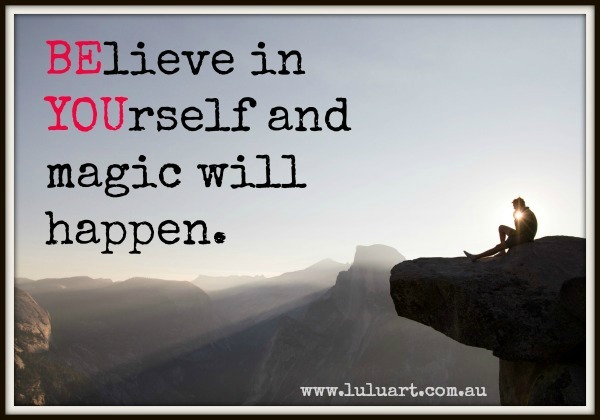 This belief has helped and supported me throughout my life, and time and time again magic has come into my life. I love this quote from Roald Dahl. 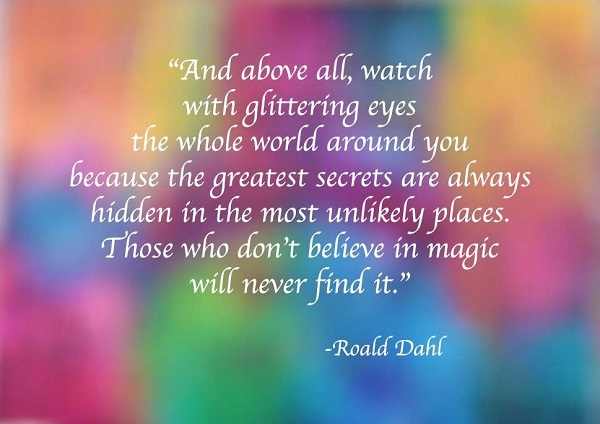 I so agree, if you don’t believe in magic you how could you ever find it? I have always been inspired by animals, birds and our beautiful world around us. My subjects come to me in dreams, meditations or a particular animal or bird will keep popping up everywhere on my walks, media or even outside my window. Once I paint them they seem to be happy and contented. My most recent inspiration has been anything with wings, Birds, Butterflies, and Dragonflies. The actual catch phrase for My Serendipity E-Course is “Fly Free”! Finally I am totally inspired by all the gorgeous Souls I teach. I never get tired of watching how a student can evolve through my workshops. They may not have painted for years, or maybe never? They just don’t believe they have the ability to create a painting but with the simple techniques, using stencils, layers and loads more, they discover that they can indeed create something beautiful. At the end of the workshop they are ecstatic and so proud of what they have produced and it is to my utmost joy that they go home and keep painting. I am so lucky and honoured to be able to live my passion by teaching what I love! This is my painting “The Gaia Tree Of Destiny”. Within us all is our own “magical” destiny. Discover your own Magic!! What is Magic? I don’t mean the Magician’s magic, or even the White Witch’s type of magic either. I am talking about the Magic that each and everyone of us has within us. We were born with it. There is Magic everywhere. We just have to look. A lovely way to connect to our inner selves or muse is to find a quiet spot, close your eyes and just “Be”. You could also listen to some amazing music. Allow your ideas be born from your own intuition. I can’t wait to see what you all envision!! Susan has just recently launched the Serendipity Intuitive E-Course. A Five Week transformation! This gives everyone all over the world the chance to experience what the serendipity has to offer. The Classroom opens on the 6th February 2016. You can find more information here. 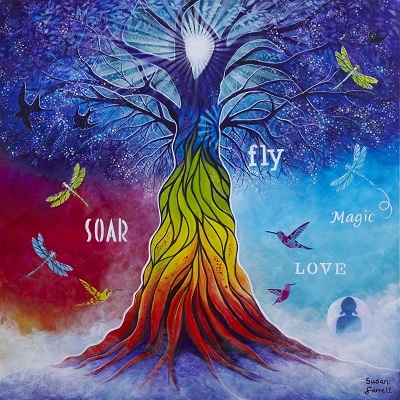 For the Week 4 prize draw Susan Farrell has generously donated a print of her beautiful painting “The Gaia Tree Of Destiny” mentioned above! It is 50cm x 50cm in size and is valued at $90. So to be in this weeks draw make sure that you load your photo of your Week 4 challenge into the relevant album in the Facebook page. We will draw a random name on Friday 5th February from those who have uploaded into the Week 4 folder by that date. So you have two weeks to complete the challenge. Now it’s time to draw a name from the photos loaded up into the Week 2 photo. Today’s lucky winner is … Lillian Lentros. Congratulations Lillian. This is the page that Lillian created about being brave. Kathryn here. It’s my turn to share my latest Lulu Art design team project with you. For this project I decided to go a little out of my comfort zone and work on a different substrate and add more dimension to my project. I had loads of fun with this and also learnt a lot during the process. I am still relatively new to mixed media so my style is still evolving. I am really enjoying playing with new products and having so much messy fun with them. Thanks again for joining me. It has been so exciting watching the past weeks photos going up in the album and hearing your stories about being brave. What a beautiful brave bunch you are! This weeks theme is about focusing on today and how we can do our best to LIVE LIFE to the fullest. Sure, we still have to do our everyday chores and conquer our to-do lists but wherever possible we should live in the moment, find fun and laughter wherever we can, make art, try something new, love with all our heart, be grateful, let go of fear, be adventurous, be silly and smile until our face hurts! 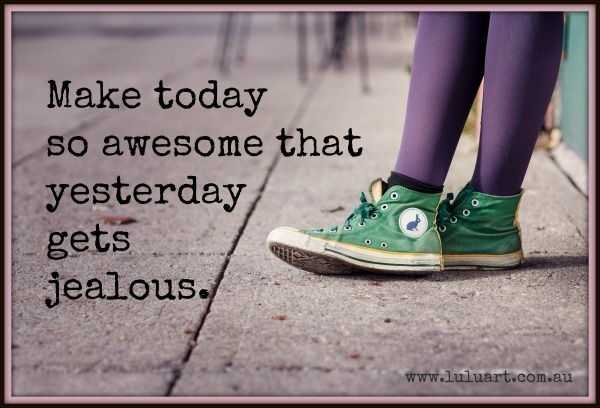 How can you make today the best day possible? One way is to scroll down to read all about an amazing event called Art-Is-You. It ticks all the boxes above. Take a chance and sign up! This is the most creative fun you could possibly have mixed in with meeting a beautiful bunch of new inspiring friends. Trust me, you don’t want to miss this! 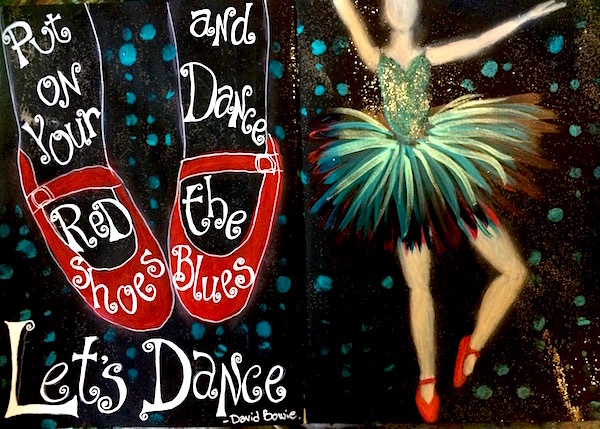 I wanted it to include a tribute to David Bowie as we lost an amazing soul this past week. Art-Is-You Mixed Media Roadshow is about to hit Australia again in July, 2016. Their inaugural Australian retreats in 2014 were a resounding success and they are repeating the stellar line up of International and Australian teachers in a 4 day extravaganza of classes. The program is jam packed. Experience fabulous mixed media workshops in Art Journaling, Assemblage, Jewellery Making, Resin, Paper Crafts, Painting, Collage and more. 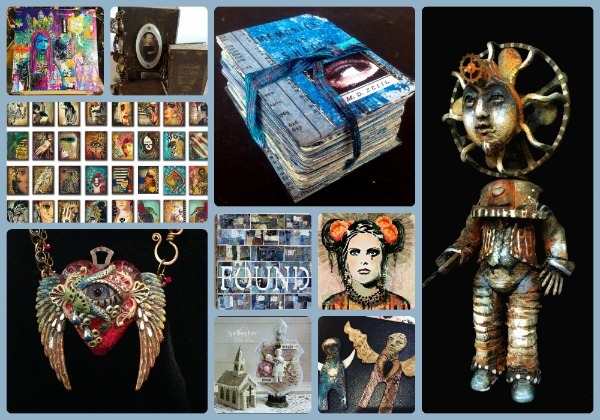 There will be an “Art Trunk” event in every state hosting local and international vendors selling beautiful one-of-a-kind gifts and jewellery, art and any manner of other objects d’art. The retreats are a complete experience with Morning Motivator sessions designed to get the blood pumping, luscious lunches included and “Eat Cake Create” moments to be enjoyed by one and all. Not forgetting Art at the Bar most nights, a time for everyone to share and show their creations from class. Lulu Art is proud to partner with Art-Is-You and will have a store on site at most venues to service your on the spot requirements. 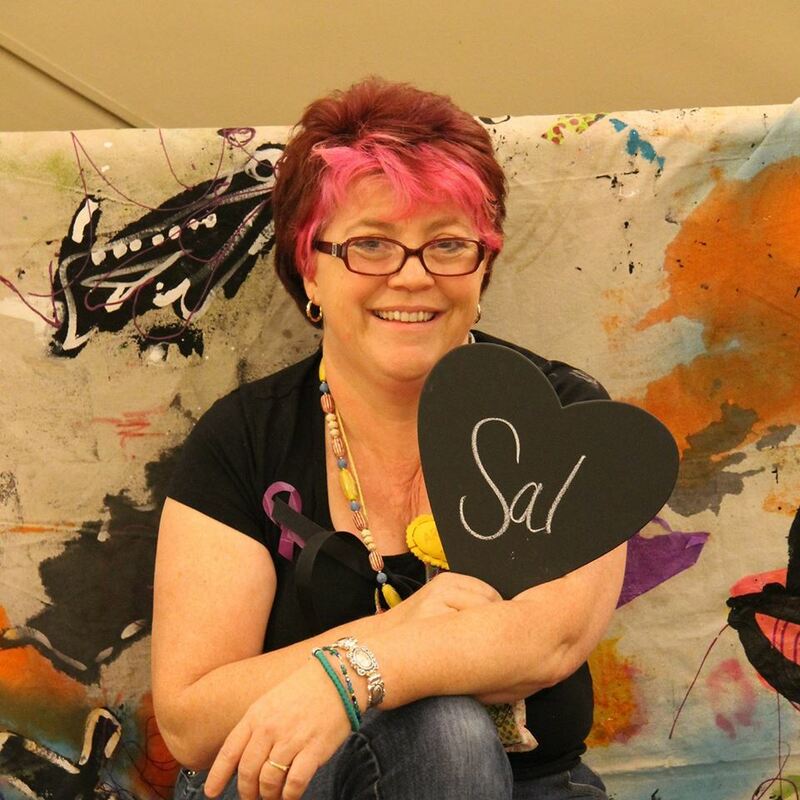 Art-Is-You Mixed Media Retreats is the brainchild of the wonderful, generous hearted and very special Sallianne McClelland, who is a lovely supporter of “Colour Me Positive”. Sallianne has been running these retreats in the USA for many years and has gained a reputation for excellence. Her retreats have a huge following in the USA with some classes selling out in hours after being announced. We are so lucky to have her once again bring the retreat to Australia. For our USA readers who haven’t heard of these retreats yet you can click here to find a venue near you and join on this fun adventure. This is a not to be missed event and Registrations are now open. You can attend for 1 session or all of them, so, what are you waiting for? This weeks challenge prize has been donated by the very generous Sharlene Toister from Compendium. 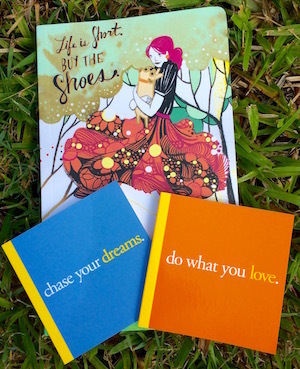 They have been creating inspiring products for over 25 years and we are delighted to have some of their gorgeous inspiring notebooks to give away. You will be seeing some more throughout the year as they’ve sent us lots of lovely books to use for our prize giveaways. We will draw a random name on Friday 29th January from those who have uploaded into the Week 3 folder by that date. Entry is open to everyone who participates, no matter where in the world you are. We have some fabulous prizes over the weeks so make sure you’re loading your photos up to be included in the draw. It’s not a game of skill, you won’t be judged on your artwork. It will be a random draw. Today is the day we draw the prize for Week 1. We had 599 photos loaded up into our Week 1 folder. That is phenomenal, thank you all so much for participating. The lucky winner this week is ….. Laura Dalgarno-Platt. Congratulations Laura! We’ll be in contact to get some details to post out your prize to you. If you want to be in the draw for our weekly prize please make sure you load the photo into the relevant weeks album on our Facebook page. This also keeps them all in one place for easy viewing and commenting. If you’re not sure how to load into an album then have a look in our Files where there is a document that explains it. You all are amazing, the way you have embraced this challenge. I am totally blown away with the amount of people who have leaped in to our first week with such enthusiasm. 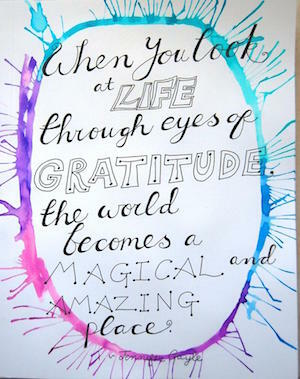 There has been some incredible artwork shared and some beautiful heartfelt sentiments around gratitude. 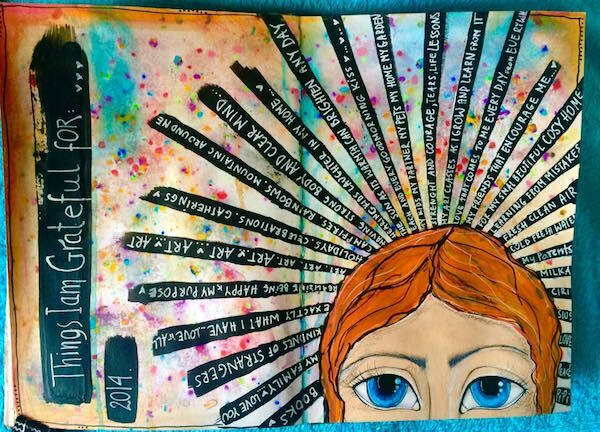 A special thank you to our first time art journalers, you have shown such wonderful courage posting your photos for us all to see in the Facebook group and I’m so very proud of you all. It is also incredibly uplifting to see the rest of you commenting, supporting and encouraging one another. Please keep it up so we can keep this beautiful energy going. This group has grown to be so much more than I ever expecting and it is a joy every day to know you are all there. 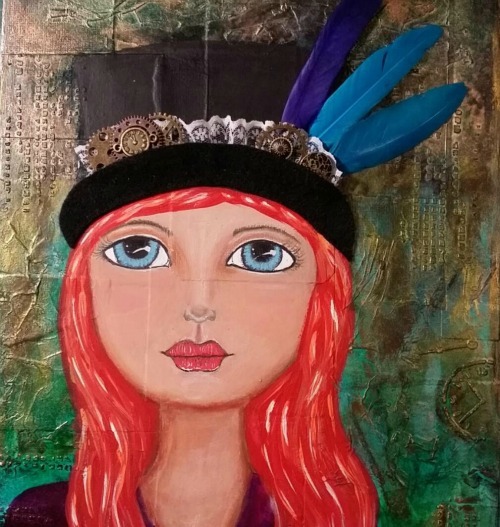 Today we have a fabulous featured artist called Kaz Pidgeon so make sure you read all the way through to find out more about Kaz and the prize she has donated for the weekly challenge. Our week 2 quote is encouraging you to BE BRAVE. The first weeks of January usually gets people thinking about their goals and what they want to achieve throughout the coming year. I know my head is full of some big scary goals for this year but I’ve learnt that it’s not enough to just write them down and hope for the best. I know that first I have to take a brave leap to get started, then work on it in smaller chunks, day by day until it is achieved. Your ducks don’t have to be in a row first! Don’t procrastinate by telling yourself that conditions have to be perfect before you start. Just take that first step. Be brave!! You can do it. You really can. Use a silhouette somewhere in your work. Kaz Pidgeon is a funky Silversmith Artist from Beerwah, Qld, Australia. 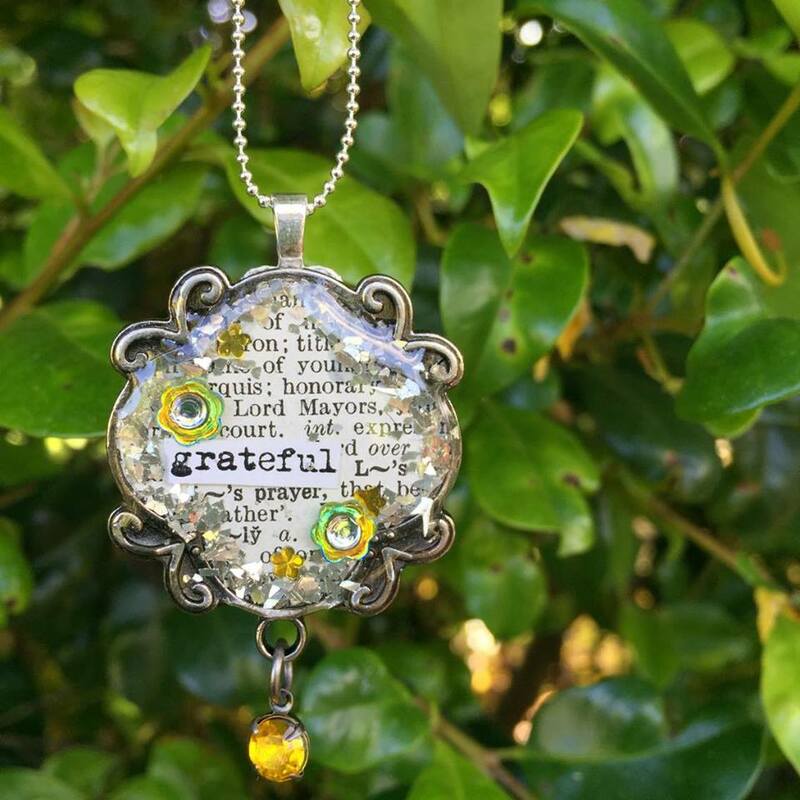 She sells her gorgeous inspiring jewellery through her Facebook page and her Etsy store. Kaz has some beautiful thoughts on bravery so read on to see what she has to say. Since my early 20’s I have occasionally needed to to be really brave (and I’m not talking sky diving or walking naked on a crowded beach 🙂 ) Some of the hardest things I have done in my life have been borne from being brave, yet they turned out to be the best thing I could have done for myself in the long run. So I chose to embrace the short and sweet version of the quote and stamp in onto some of my pieces… wow, I was overwhelmed with orders from women in all walks of life, old and young… so it got me thinking that many of you amazing women out there must be embracing the act of being brave, for what ever your reasons .. to those of you, I send you my encouragement and my love. Firstly and this is such a cliché, but Mother Nature, for her extraordinary beauty that is found everywhere. From the simplest drop of water on a leaf to the soaring vista of the Himalaya, it makes my heart sing and my soul smile. Kaz from Birdsong Silver has made this gorgeous pendant to give away as this weeks prize draw! So to be in this weeks draw make sure that you load your photo of your Week 2 challenge into the relevant album in the Facebook page. We will draw a random name on Friday 22nd January from those who have uploaded into the Week 2 folder by that date. Wow, what an overwhelming response we have had to this weekly journal challenge. At the time of writing this we have had over 1600 of you sign up to participate with over 1000 joining the facebook page! You are all so welcome here. My heart is overflowing watching how you have all embraced this challenge and seeing you already supporting and encouraging one another. This is going to be an amazing year full of creative fun, friendship and positivity. Our first challenge for the year is all about GRATITUDE. I love to bring in the New Year by celebrating and focusing on everything I am grateful for from the year just passed. I know some of you may have had a tough year but no matter what has happened there is always something to be grateful for. 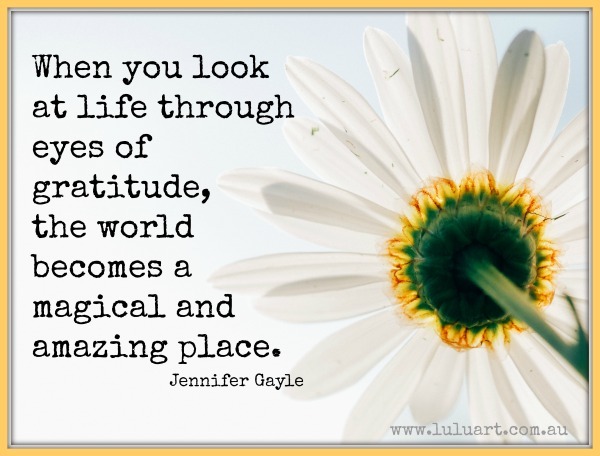 I believe by focusing on gratitude we then attract more of the good things into our lives in times ahead. Use an image or some words that show something that you are grateful for from 2015. This is a page I created using the quote. Here is a page that one of my previous design team members (and beautiful friend) Monika Dabrowska-Ejmont, created for us at the beginning of 2015 where she documented all the things she was grateful for for 2014. We thought it was the perfect one to showcase this quote. As a bonus we also have a video of the page that Monika created so you can see how it was put together. Monika (Green Kitten Art) has donated a gorgeous piece of jewellery she has created for our first weekly prize draw. To go in the draw you need to upload a picture of your journal page for Week 1 in the relevant folder on our Facebook page. We will draw a random name on Friday 15th January from those who have uploaded into the Week 1 folder by that date. 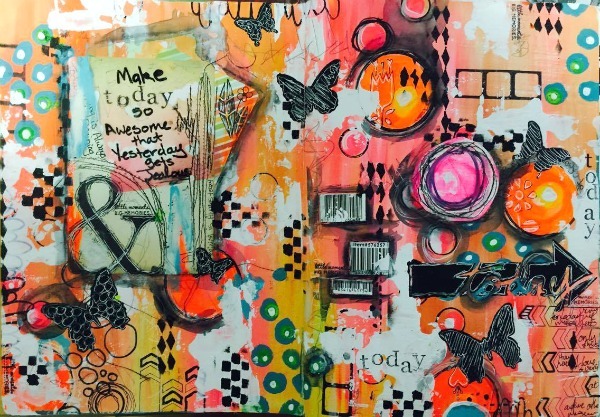 Not sure where to start with Art Journaling? 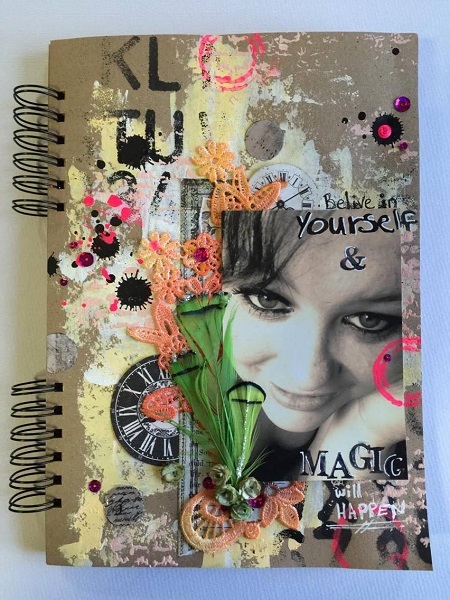 Kristal Norton – What is an Art Journal? I can’t always reply to comments on FB .. but I still love you! The FB page is so big now that I don’t always have time to leave comments or see everything that is posted. Please PM me if you have an urgent question as I’m more likely to see it. Don’t forget our time zones, if I’m not answering I might be sleeping.